I needed some nail art ideas and so I turned to my kids. Rasta colours were suggested. And well, it didn't take much to talk me into it lol. 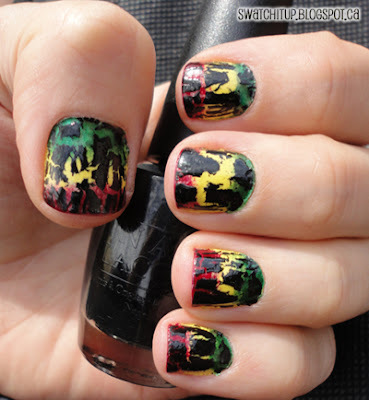 A rasta manicure has been on my to-do list for some time now. Combine that with the fact that I was in the mood to try a (gradient?) sponge manicure anyways and voila! Indeed it was the right colour of green, but I didn't realise I would need to sponge it on a bit by itself first. I knew to do that with the yellow, which turned out lovely - but well as I said... 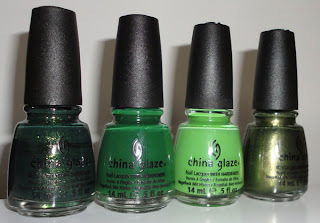 I blame the lack of green polish in my stash. (every time I say that it makes me just a bit sick - how could I have let this happen?! No proper greens you say?? LOL... oh man what's happening to me?!) So I decided to break out the neglected black crackle from my stash and give it a bit of an 'up-do'. I liked how it turned out in the end and the crackle (though usually unused) did save the manicure imho. I got a lot of wear out of this manicure too which was great. All China Glaze left to right: Glittering Garland, Holly-Day, Gaga for Green, and Agro. 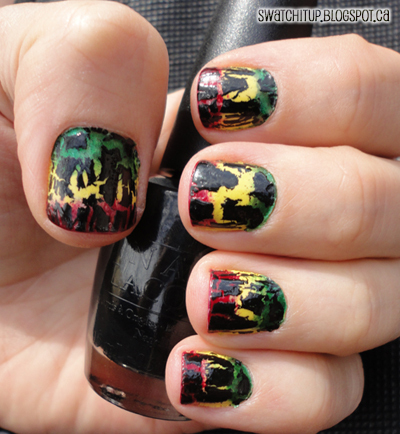 These are great, the black crackle makes them really rasta looking somehow! And yay for opportunities to get new polishes! Also, I've tagged you for some blog awards, see my post here! I like the black too - so I'm trying to figure out another way to add black to the look. ??? Ideas? 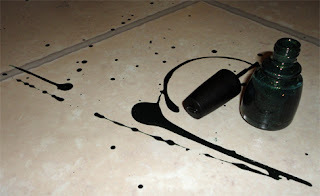 Hi, I just found your blog through Giveaway Lifestyle's Blog Hop! Hiya :) Thanks for checking out and following my blog. I appreciate your comment on the mani too, thanks!